This item has to be one of the most used (besides my camera) on any trip we have done with our kids! It has saved us on so many occasions where there were no toilets near by, and even when there were, but aren't too appealing to use. We still take it with us everywhere we go and even the older kids still use it if necessary. The disposable bags make it easy to discard the deposits making clean up is a breeze. Its compact size and light weight composition allows us to fit it in any travel bag including hikes. It can be used free standing or placed over a toilet seat for added comfort and stability. Definitely a must have item for traveling with kids on any occasions! Its compact size and light weight composition allows to fit it in any travel bag including hikes. It can be used free standing or placed over a toilet seat for added comfort and stability. 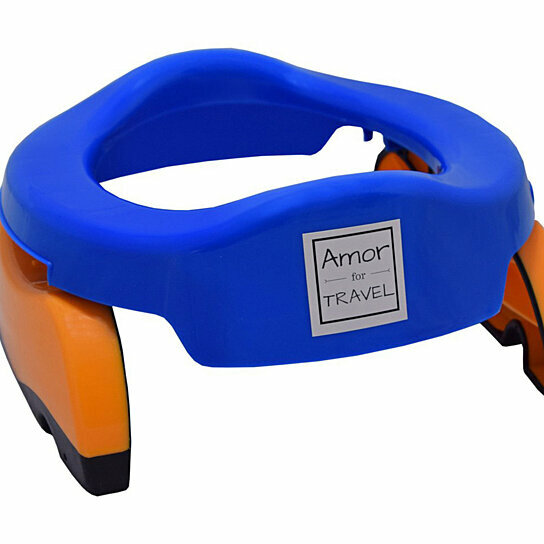 Portable Travel Potty. Color: Blue & Orange.